Do you know how that red, ripe-looking tomato in your grocery store came to be? Well, first it was bred to have tough skin so it would hold up during shipping. Then, it was harvested green and unripe and held in cold storage. Finally it was gassed with chemicals to turn it red and ripe-looking. Yum! Absolutely tasteless! They look beautiful, ripe red and sweet... but they're not. That's what has happened to the taste of store-bought tomatoes, and many other vegetables, too. Hybrid strains are developed to favor safe shipping and long shelf life... at the expense of flavor and nutrition. You can reclaim tasty vegetables and fruit for your family with a hydroponic garden. Pick a fragile but delicious variety--- give it all the proper nutrients--- let it vine ripen--- and enjoy your very own home-grown, tender sweet produce! We advocate that you start your hydroponics plants from seed. We have created a great page explaining how to start seeds properly here: Seeds & Seedlings. Of course, you can always just go to the local garden center and pick up some vegetable seedlings (baby plants). You will likely find tomato, pepper, eggplant, and cucumber seedlings in spring, and baby broccoli, cabbage and lettuce plants in the fall. Although you can use store bought seedlings for your hydroponics plants, there are some drawbacks to doing this. You must wash off the soil from their roots, which can injure them. 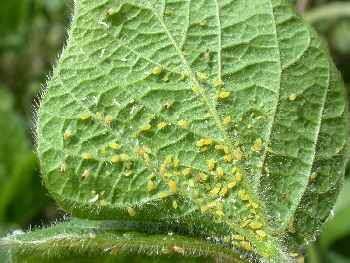 You also can be introducing diseases, pests and fungi into your sterile hydroponic setup, which might be very hard to eradicate. You are also missing half the fun and one of the major advantages of home gardening--- variety. In buying nursery seedlings, you are limited to just a couple strains THEY chose. Instead of tough-skinned, tasteless C-322x strain of tomatoes, you can grow your own delicate, savory Burpee Big Boys from seed! Get a few seed catalogs and study them. It's great fun to pick out the best possible hydroponics plants varieties for your needs and growing climate. And you can get adventurous and try some really unusual or brand-new strains of plants. I have always loved Burpee Seeds in particular for their innovative hybrids program. 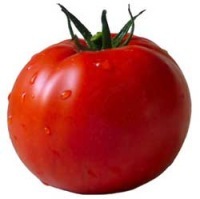 Ever taste a Burpee Big Boy tomato? These are some seed companies which put out colorful, fun and informative catalogs. Find 'em online and order their print catalogs. Poring over seed catalogs while it's snowing outside is great for lifting your spirits, and is a Great American Pasttime. Interested in heirloom vegetables? We have a great page on them here: Heirloom Seeds. At first anyway, try to stick to bush, self-pollinating, and special "greenhouse" varieties of vegetables. We list some "hydroponically-friendly" varieties to get you started on our Veggies Page. And if you do ever need help with pollinating your indoor plants, there's always the Pollination Page. Basil, Bibb and Buttercrunch lettuce--------- 6" x 6"
Looseleaf and Oakleaf lettuce----------7" x 7"
Herbs------------3" x 3" or 4" x 4"
There is more "food for thought" about choosing what to plant and when, here: What To Grow? With a little effort and attention, you can keep your hydroponic garden producing constantly, and reap an incredible amount of produce from one small plot. The trick is to keep planting. Never let a productive inch remain fallow. Radishes are good for this. 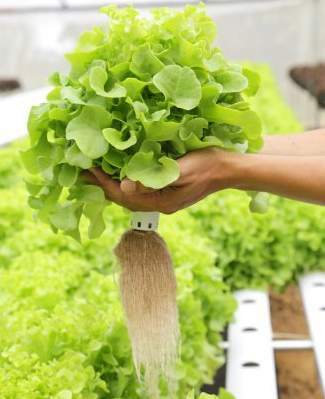 Once you harvest that head of lettuce or cabbage, plant more lettuce or sow radish seeds to take it's place. Once produce is full-grown and ripe, pick it, even if you have to give it away. If left on the vine, it signals the plant to stop producing. As far as lettuces and other greens, don't just pull the tough outer leaves. Occasionally harvest the entire plant and enjoy the tender, tasty lettuce hearts in a super gourmet salad. Re-seed the spot.